I know there are quite a few editions of Dungeons and Dragons (D&D), each of which has loads of rules, source, and splat books. But how do I know which edition the books I'm looking at are for? A lot of the time the ones in hobby stores are wrapped up, or you'll buy from elsewhere that doesn't say in the description, and the covers just say D&D. Is there a way to identify which edition of D&D the books I'm buying are for, either from the cover or some description in the book? For the purposes of this question I'm asking about core rule books only. Eg. PHB, MM, and DMG. Hopefully the answer to this can be carried over to other books. Pictured below are photos of the most common logo or two for each edition, both on the books' spines and front covers. The "spine" logo also appears on the lower-left part of most covers, and both these logos are in the corresponding places on the Starter Set box. 5e also released a special edition black cover with distinctive artwork. Notably, the stylized dragon ampersand (&) in the logo is the same as the original 5e books. The black covers do not have the spine artwork on the cover. 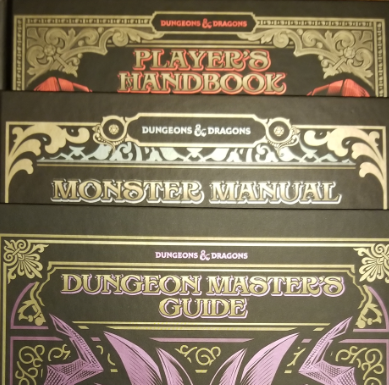 The PHB is red, the MM light blue, and the DMG dark purple. 3.0/3.5 used the same logo; the logo varied a bit in execution, but is fundamentally unchanged from book to book. Pictured below are two variations, spines and covers. Books for 3.5 will say "v3.5" both on the spine and on the cover. The (few) examples I own have the "v3.5" at the bottom of the spine and in the lower part of the cover, well away from the main logo. Books for 3e just have the logo, no version-marker. The logo as presented in full-color (corebooks, for example) and foil. Look at the logo at the top of the front cover. 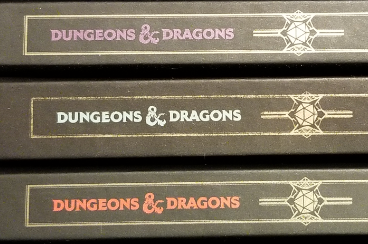 In short, a small red "D&D" logo means 5th edition, a large red "Dungeons & Dragons" logo means 4th edition, "Dungeons & Dragons" with a sword through it is 3rd edition. A product code near the barcode beginning with a single letter also indicates 5th edition. Many books also explicitly state their edition on the rear blurb. D&D 5th edition: The core rulebooks have "D&D" printed at the top in red, followed by the name of the book in white. The text at the rear of the books will say "fifth edition". This is generally true for other books of the edition, except for the special cover versions. D&D 4th edition: The core rulebooks say "Dungeons & Dragons" at the top in red, followed by the book title in a smaller font on a blue horizontal banner. The rear of the book will note that they are for use with 4th edition. There was also an Essentials product line, which is marked Essentials on the front cover. Many 4e books also have an advertisement for the D&D Insider service on the back. D&D 3rd edition: The core rulebooks and most sourcebooks have a "Dungeons & Dragons" logo drawn upon a brass plate with a horizontal sword through it. The books tend to be styled as if a physical book inlaid with gems and such (interestingly, this isn't CG; they made physical models and photographed them), although not all books are styled this way (e.g. Draconomicon uses full-page art). The core rulebooks for D&D 3.5 will say "v.3.5" on the front. AD&D 2e: Will clearly say "Advanced Dungeons & Dragons 2nd edition" on the front cover. The late-90s book have an iconic black border. The 2000s special reprints have a unique cover. 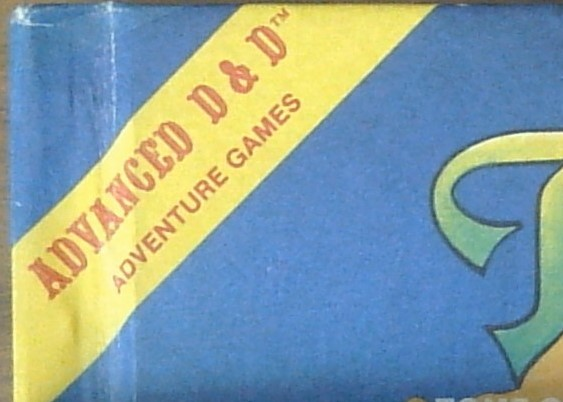 AD&D 1e: Will say "Advanced Dungeons & Dragons", but will not note the edition, as second edition had not yet been invented. You are unlikely to encounter these still on sale. The only ambiguous books you are likely to encounter are the special edition versions of 5th edition books, which eschew the usual branding for special artwork; these can be clearly identified by the product ID codes listed near the barcode, which begin with a letter rather than a number. When shopping online, looking at the product release date will also help identify the books. For the core rulebooks that's 2000 (3e), 2003 (3.5), 2008 (4e) and 2014 (5e). Not the answer you're looking for? Browse other questions tagged dungeons-and-dragons product-identification books or ask your own question. Do the spells of the paladin's oaths works like cantrips? Should I buy second-hand core rule books?